Did you know that most vocals recorded at home FAIL, due to inadequate acoustic treatment? The fact is, your bedroom was not designed for recording vocals. Even with a great mic, if that mic is picking up unwanted reflections from your room, the results can be very unpleasant and unprofessional. Tired of unpleasant sounding vocal recordings? The RF-100 can IMPROVE your vocal recordings INSTANTLY! The RF-100 Reflection Filter by MXL provides portable sound isolation and is designed to reduce unwanted reflections and ambient room noise when recording in untreated performance spaces - a major problem in most home and project studios. The desired result of course is obtaining the driest vocal and instrument recordings possible. Recordings free from bad reflections and excessive room ambience are easier to work with and always sit better in the mix helping to achieve that professional radio-ready sound. The RF-100 features two unique side panels allowing it to adapt to any recording environment or be adjusted to obtain the sound you're looking for. 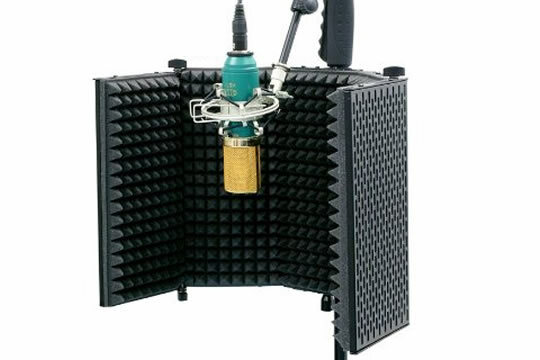 Also, its lightweight design and included mounting hardware make it compatible with most mic stands eliminating the need to purchase a heavy-duty and often pricey stand to accommodate the filter. If you're not totally satisfied or do not feel that the RF-100 has improved the quality of your vocals, return it for a full refund (within 15 days of delivery). LIMITED STOCK - DUE TO HIGH DEMAND, WE MAY SELL OUT AT ANYTIME - HURRY AND GET YOURS NOW! Click "BUY NOW" to order the RF-100 and Start Recording Better Vocals! *Microphone and mic stand NOT included.